This film is the fifth and final in our sequence of LGBTQI-Jewish ‘ritual year’ documentary programmes. It was the only programme made by filming as the ritual took place, rather than ‘pre-creating’ elements of ritual activity, prior to the actual service. In itself, the process of filming at the service during the Seder was not unproblematic, in terms of team members being able to gather visual and audio recording permissions from people who arrived late, or who changed their minds about being seen or heard having reached a decision on participation on the spur of the moment. In relation to methodological issues and challenges see further, papers and discussions on methods, and an article on RR and how this relates to the processes of anthropological film-making (by Searle Kochberg) elsewhere on this website; as well as watching out for forthcoming journal articles currently under development. 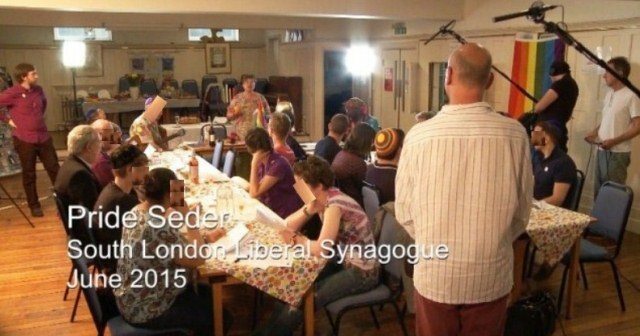 The documentary film which these notes support, consists of footage of the Pride Seder which took place at the South London Liberal Synagogue the night before the London LGBT Pride march and celebration in June 2015. The footage is interspersed with short discussions around identity; visibility and invisibility of lesbians in ‘Pride’ and the role of activism amongst LGBTQI Jewish participants; as well an interview with the (cis-gender, female, long-term LGBTQI ally) Rabbi who conducted the Seder at her synagogue. A Seder (a Hebrew term meaning ‘order’ precisely because there is a strict order, and regulation in relation to texts read; prayers recited; songs sung; food and drink consumed; symbolic questions asked; and the use of ritual objects on a ‘Seder Plate’) is a ritual meal and service inextricably bound to the fundamentally important festival of Pesach which commemorates the liberation of Jews from slavery in Egypt and their Exodus to freedom. For most Jewish people, reference to a Seder will lead to an assumption that the festival spoken of is Pesach; although there is a growing standardisation, and acceptance of, the practice, within various denominations across the Jewish community, of the celebration of the festival of Tu B’Shvat (New Year (or Birthday) of the Trees) through holding a Seder which reflects on the natural world and ecological concerns. (See notes elsewhere on this website – Introduction to the Ritual Cycle – for a full discussion of these festivals). Holding a Seder thus has profound psychological and ritual significance for Jews, and is associated with moral responsibility and recognition of themes of social justice. In holding a Pride Seder which incorporates secular (profane) ritual and symbols – for example rainbow themed flags and foods; bright clothing with rainbow colours and symbolic items associated with Pride celebrations – and also sacred (religious) items such as candles and a Seder plate, we demonstrate ritual activities which represents a blending of identities and recognition of the importance of Jewish LGBTQI Pride. The secular celebratory event of Pride (formerly known as Gay Pride; subsequently renamed Lesbian and Gay Pride from the 1980s onwards and now simply known as Pride so as to inclusively incorporate wider LGBTQI communities), occurs throughout the world on various dates, largely centred around the month of June; although in some countries distinct or variable dates have been selected to highlight the importance of national events related to LGBTQI equalities (for example Moscow Pride takes place in May to commemorate legislation which decriminalised gay male relationships in 1993). On an international level, June was chosen for LGBT+ ‘Pride Month’ to commemorate the turning point in Gay civil liberties and struggle against oppression of LGBTQI people which occurred when the Stonewall riots took place in June 1969; during which, for the first time, civil disobedience occurred when drag queens, butch lesbians, gay men and other street people fought back during a police raid (allegedly for liquor licence violations) on the popular Stonewall Inn in Greenwich Village. This socio-political turning point, as LGBTQI people demonstrated their pride in their identity, and unwillingness to be repeatedly harassed and oppressed for their sexual orientation through the strategic use of legislation unrelated to sexualities; created a revolution in identity politics which rapidly reverberated through the US and around the world. As a result of the events at Stonewall, and ongoing commemoration of the riots, many Pride events around the world are now held during June with the dual purpose of recognising the transformatory impact LGBT people have had in the world, and ensuring that the communities are visible to both LGBTQI and straight people. However, the carnivalesque, celebratory aspects of Pride (and resultant ‘mainstreaming’ of the events) have increased dramatically in recent years, with many families, young people and individuals who have not previously aligned with LGBTQI communities or politics, attending purely to enjoy the fun, as Pride events are increasingly ‘marketed’ as part of the cycle of events occurring in major cities around the world. In recent years, in part driven by the increased homophobic and transphobic attacks in Europe, as well as an increase in repressive legislation in Russia and some African countries; there has been increasing community concern over what some individuals perceive to be the growing apoliticisation of Pride events. In relation to this disquiet, a discussion panel ‘Pride: What Relevance is It?’ took place at the Beit Klal Yisrael (BKY) synagogue in London on the 13th June 2015. BKY is a schul (synagogue) which a number of RR participants attend, and which has always been aligned with LGBT+ political and social solidarity and radical social justice initiatives; being founded by the out lesbian rabbi and Jewish intellectual Sheila Shulman in 1990; as such it is unsurprising to find this community engaged in such debate. The theme of politicisation of LGBTQI identities and the role of Jewish lesbian feminist social activism arose too, within the final showcase event of RR in November 2015 and also amongst focus group participants. See further, blogs and materials on the RR website which touch upon feminism, political activism and LGBTQI politics. London, (where the main Ritual Reconstructed events have taken place) has held an annual Pride event since the 1st July 1972; a date initially selected to coincide with the nearest Saturday to the anniversary of the 1969 Stonewall Riots. The date has varied slightly in more recent years, partially in response to the fact that the event has expanded the number of days during which it occurs. Generally, London Pride takes place in the last week of June. London Pride is one of the largest Pride events in Europe (around one million people were believed to attend in 2015) as well as being the oldest. Events associated with Pride include carnival type parades as well as serious political rallies where discussion on hate crime, and civil rights in the UK, as well as worldwide data of homophobia and solidarity with oppressed LGBTQI people elsewhere are debated. Music is performed, entertainment and street parties also take place after the march which proceeds through Central London. In 2016 the dates of London Pride are 25th and 26th June. What are specifically LGBTQI elements in the Seder shown in this film? Over the last twenty years the Jewish Gay and Lesbian Group have held pre-Pride services incorporating Jewish and LGBTQI themes; but the development of a full Pride Seder (as shown in this film) within a wider Jewish community context (i.e. with participants who may not themselves identify as LGBTQI) marks a new step in reconstructed rituals and syncretic identities within the UK. A high heeled shoe, symbolic of those worn, and thrown as missiles by drag queens and transgender people during the Stonewall riots. The pink and black triangles on the Seder plate signify oppression of LGBT people during the Nazi era as gay men and lesbians were forced to the pink and black triangles in concentration camps as a mark of ‘deviancy’ and being ‘anti-socials’. The exotic fruits signify the “fruits” (a prejorative term sometimes used to signify LGBT people – a word reclaimed in the context of our Seder) who are seated around the Pride Seder table. The brick on the Seder plate signifies the resistance of those brave LGBT people who took part in the Stonewall Riots (Resistance) in 1969. The rainbow coloured foods on our table celebrate Pride and the International Rainbow LGBTQI flag. Within the ritual meal we follow the same characteristic blessings and practices as during the Pesach Seder. During Pesach we recall and mark (with sadness) the ’10 plagues’ which befell the Egyptians as a punishment for oppression, and holding the Israelites in slavery. We do this by dropping wine from our fingers, obtained through dipped our finger into our glass of wine and then dripping the wine drops onto our plates like a drop of blood whilst naming each plague. Silence, when we do not speak out and name our identities, and the oppression of others and ourselves. And also: ”If I were to remain silent, I’d be guilty of complicity.” Albert Einstein (14/3/1879 – 18/4/1955) Physicist and Jew. In this Seder we, and our allies speak out, and celebrate our Pride as LGBTQI people, as Jews, and in solidarity with all those who are oppressed. In the USA LGBTQI Seders have taken place prior to Pesach and increasingly Pride (see for example the first ever Queer Pride Haggadah which was first used in 1995 in Berkeley, California by the ‘Queer Minyan’ (a minyan is the quorum of ten Jewish adults required to enable certain religious obligations and rituals to take place), and an adapted form, ‘A Stonewall Seder’ in New York in 1997: http://www.anotherqueerjubu.com/StonewallShabbatSeder97004.pdf. However the Seder filmed for Ritual Reconstructed is, to the best our knowledge, the first time such an event has taken place in the UK. Accordingly, whilst similarities exist between the USA and UK Pride Seders, the Seder captured on film is a uniquely British, London version of this celebration, and one which participants anticipate will develop and grow as it becomes a part of the annual ritual cycle and community ‘minhag’ (customary practice, specific to particular Jewish communities) develops..
 See the Introduction to the Ritual Year notes for further information on Pesach and Seder plates, but the six ritual and symbolic items contained on a Pesach seder plate are bound into the narrative of Exodus. Accordingly in our Pride Seder the items on the seder plate are bound into the story of LGBTQI pride and liberation from oppression.